Vincent is stopped by Inadu's men who want the book back. Vincent quickly takes them out. Elijah trashes a room because Hayley will not see him. Klaus says to give her time and everything will be okay. Hayley then tries to speak to Klaus about Hope's future, but he leaves her with Elijah. She cannot bare to look at him, so she runs off. She visits Hope who acts erratic and tells Hayley to leave her to finish her drawing. Marcel tells Rebekah that they cannot be together, and reawakens Sofya. She tells him the villain is still out there. Rebekah tries to help Hayley make things right with Elijah, but Hayley revealed some shocking truths about the way the family kills without thinking about it. When Rebekah went to comfort Hope after learning the Hollow is back, Hope daggers her. Freya and Hayley figure out that The Hollow is inside Hope and question their next move. Vincent kills himself to speak with Inadu's mother and Marcel is tasked with reviving him. Klaus finds out that Hope is possessed and he goes into a rage. Inadu's spirit leaves Hope's body and attacks Freya and Hayley. Marcel fights with The Hollow's henchmen and Sofya saves his life. 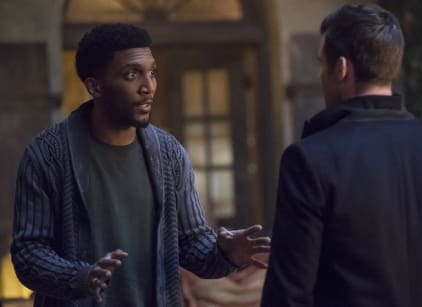 When he brings Vincent back, they make an alliance with Klaus and Elijah. Vincent says they should be able to get Klaus to Hope. Marcel tricks Inadu and Vincent tries to do a spell, but she overpowers him. She manages to take over Hope's body for good. Vincent says the only way to save her is to get rid of the always and forever part of the family. Freya: You look good for an allnighter. Keelin: Hey, what are you doing here? Freya: I just came here to see you. Keelin: Since the whole greeting me with coffee is totally not you, I am worried about why you're here. Permalink: Since the whole greeting me with coffee is totally not you, I am worried about why you're here. Klaus: You should be celebrating your return, brother. Klaus: Hayley's still not talking to you then? Give her time; she'll come round. The Originals Round Table: Is Haylijah Doomed?